Looking for a creative, kid-friendly way to green your tot’s space with plants? 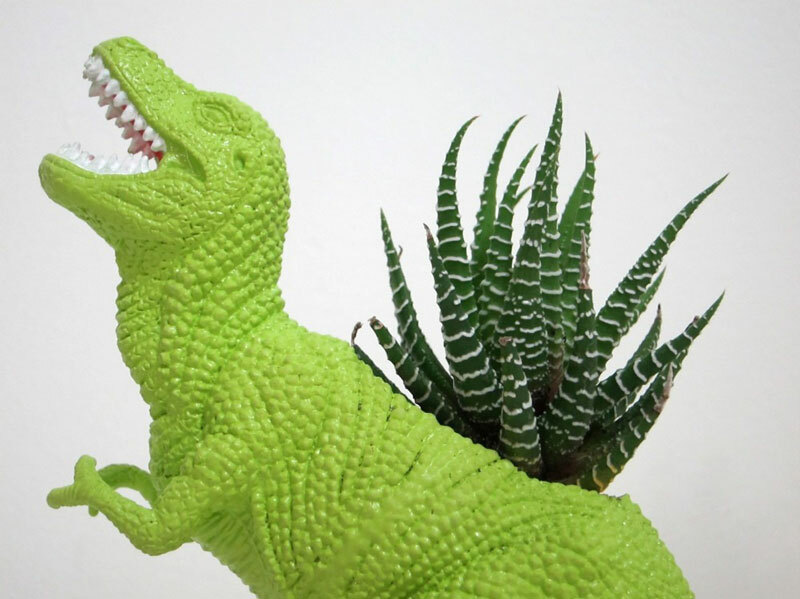 Our pals from the Mesozoic Era are brilliantly modernized with these prehistoric planters. Plastic dinosaur toys are kept out of the landfill, and are instead primed, hand painted, sealed and drilled for drainage holes. A vibrant succulent is then strategically planted into each dino’s back, and may grow wild or boast a trim tailored to your tot’s liking. Allosaurus, Velociraptor, Tyrannosaurus, and more — these creatures are making a roaring comeback. But why only create planters from toys of the Cretaceous period? Because succulents require very little soil and infrequent watering, this repurposing concept can be applied to any out-of-favor toy lying around your kid’s room. That dinged up dumper can become a model Truck Farm. Missy, the dolly with the missing limbs, can put her head to good use. Lego bricks can be turned into lasting gardens. Bowling pins? Piggy banks? 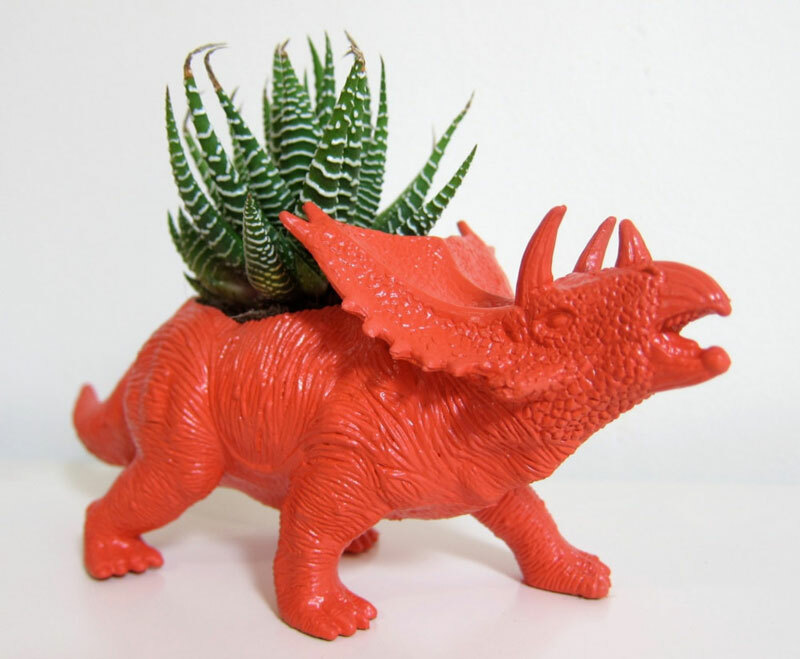 Fact is, most any other plastic item of the injection-molded variety can yield the same result… Though these planters may not be as eye-catching as a Mastodon sporting a prickly mo-hawk. I love the toy planters. Thanks for featuring my dinosaur planters!!!! Came across them today! Looking for a creative, kid-friendly way to green your tot's space with plants? Our pals from the Mesozoic Era are brilliantly modernized with these prehistoric planters. Plastic dinosaur toys are kept out of the landfill, and are instead primed, hand painted, sealed and drilled for drainage holes. A vibrant succulent is then strategically planted into each dino's back, and may grow wild or boast a trim tailored to your tot's liking. Allosaurus, Velociraptor, Tyrannosaurus, and more -- these creatures are making a roaring comeback.